UAE’s Enoc Group, a global operator across the energy sector value chain, has awarded the engineering, procurement and construction (EPC) contract for a 16.2-km jet fuel pipeline linking its storage terminals in Jebel Ali with Al Maktoum International Airport, Dubai World Central (DWC) to Dubai-based Albanna Engineering. The contract was made through Enoc’s subsidiary Horizon Terminals, reported Emirates news agency Wam. The construction of the pipeline is expected to be completed in 24 months and will be operational in the first quarter of 2020, in time for Expo 2020 Dubai. Upon completion, the pipeline will carry 2,000 cu m of jet fuel per hour to DWC, which is billed to be the world’s largest and will receive a significant share of international visitors to the Expo. Saif Humaid Al Falasi, group CEO of Enoc, said: “The jet fuel pipeline to DWC is a strategic infrastructure project that aligns with the growth vision of Dubai and supports the preparations for Expo 2020 Dubai. Set in the heart of the new aviation and logistics hub, Dubai South, the airport will serve as a global aviation centre, and we are setting the benchmark to offer jet fuel services to a large number of international carriers using the airport. He added awarding the contract underlines Enoc’s commitment to fuel Dubai and the nation’s economic growth as it will play a vital role in meeting the growing need for aviation fuel seamlessly. The pipeline will be equipped with state-of-the-art safety features including a leak detection system, complete automation control and quality control, among others. 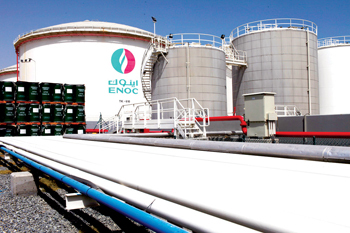 Enoc currently supplies jet fuel to Dubai International Airport through a 58-km pipeline that has a storage capacity of 141,500 cu m.